Nendaz-Vente Immobilier is an agency which states its preference for a quality welcome and conviviality. Situated in the charming ski resort of Nendaz and next to the starting point of the cable car, the agency Nendaz-Vente Immobilier Sàrl greet clients in a cosy and warm setting, where you should take the time to linger over a discussion in company of the warm-hearted and likeable director Françoise Gillioz; and Jonathan Charbonnet (draftsman building). 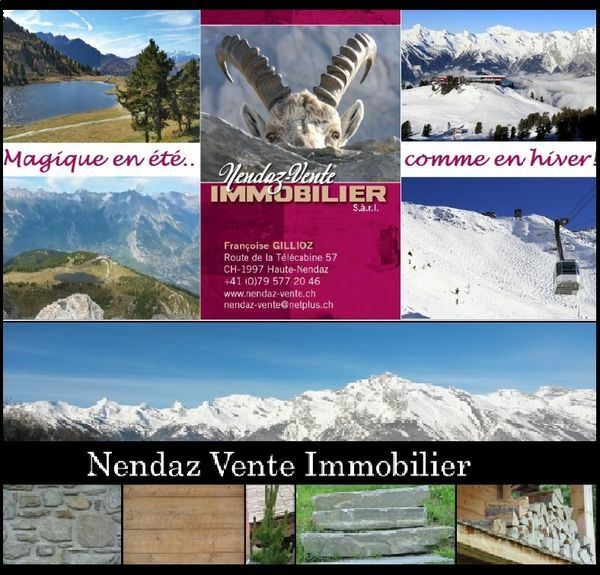 Since 2006 Nendaz-Vente Immobilier is actively engaged in buying and selling apartments, chalets, villa, turnkey project as well as in the location for the week, saison or year of chalet or apartment. Furthermore we handle some promotions (property development) of apartments and chalets in either main residence (Beuson, Bleusy) or secondary residence (Bleusy, Bermouche, Les Djiettes, les Clèves, les Ries, Tena). We manage besides Novelly SA, a society which is not only responsible for a part of the parking place in Siviez, but also for the location of apartment in Siviez (week or saison). Nendaz-Vente Immobilier Sàrl stand also at your disposal for the insurance of building construction, personal liability insurance and household contents insurance. Personalized advice and support of the client from the information gathering, through the search for real estate and visits, until the sale ; appointment with your our specialized partners (Bank, notary, fiduciary, insurance broker, geologist, geometer, architect, engineer, and if necessary : commune of Nendaz, Canton of Valais or Forest service) : Everything can be organized by us, just for you ! It is extremely important for us to establish a trustworthy relation with customers. Here you will feel that you’re fully heard and that we consider your needs. For our part, you can rest assured that we will do all that we can to look after the real estate which will fulfil your expectations ! With Nendaz-Vente Immobilier, together, we make your dreams become a reality !